Just as they had last Sunday, the teenagers of Dungannon queued, shivered together in huddles and wore their best and brightest tops. This time, in the cold light of a miserable spring morning, the queues were sombre and the gear was not an indication of youthful exuberance but an expression of solidarity with the family of Morgan Barnard (17), who had requested the departure from traditional black. Their day was black enough as it was, one mourner pointed out - and if Hawaiian shirts looked incongruous in Mass, they were not as out of place as a teenager in a coffin. Morgan's mother, Maria, is seven months' pregnant with a child who will never know their oldest brother. She had to be helped into the church by her husband, James, and son, Calvin, the three of them forming a kind of Pieta of unspeakable grief. Seamus Heaney's famous poem, Mid Term Break, is given its poignancy by the image of the tiny coffin - "a foot for every year". And 17-year-old Lauren Bullock's coffin, with its pink and white flowers, was a symbol of someone on the precipice between childhood and adulthood. Outside the church, her friends formed a kind of cheerleader standing guard. Inside, the offertory gifts included trophies she had won and items representing her many interests - she was a cheerleader, a footballer, and a girl scout, the congregation heard. She had just started learning to drive. Her dog, Benji, was her "pride and joy". It was these little snapshots of innocence that made the day so difficult. There is a particular silence that comes over a small town for the funeral of a young person. It falls across the main street, like an eclipse. In Edendork the shops were shuttered for the funeral of 16-year-old Connor Currie; one cafe had briefly opened to serve free refreshments to mourners. Barely a sound could be heard as the hymns from the service boomed out of the chapel to the thousands lining the verges around the graveyard. 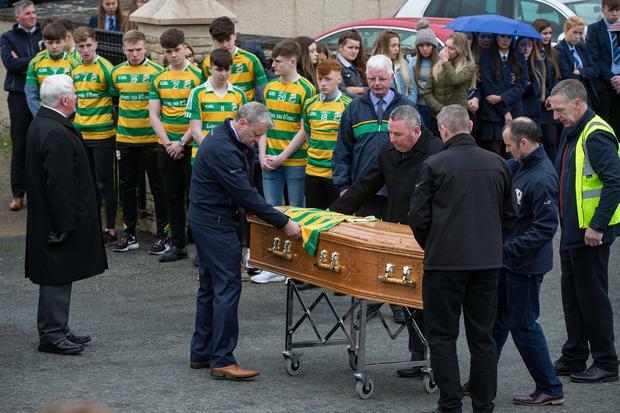 His young friends from Edendork GAA club huddled together in their jerseys in front of the coffin, paying their final respects. The priest, like all of the priests on this awful day, invoked the story of Saint Patrick, who like these young victims, had been cruelly torn from his family while in his mid-teens. But it was the sounds and images of the Masses that provided a clearer portrait of the loss: sobs ringing out from the pews, young faces stricken with tears; several students fainting from the stress of the last week. 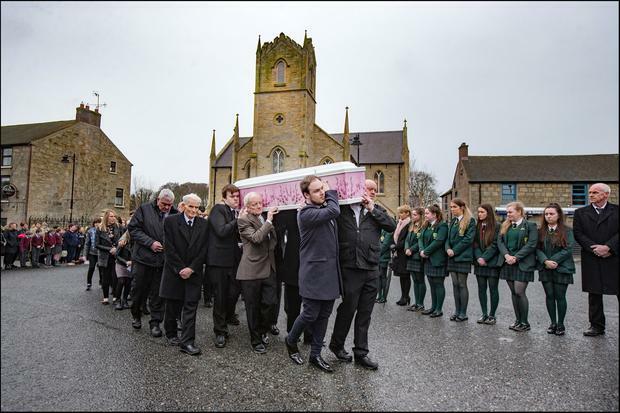 The Archbishop of Armagh, Eamon Martin, noted that many of the young faces at Morgan Barnard's funeral had bruises on their faces. They were a stark reminder that, as terrible as these tragedies were, it could have been much worse. What exactly happened at the Greenvale Hotel in Cookstown will continue to be analysed for years to come. How a few hundred kids outside a teenage disco could have become involved in such a deadly crush is now the subject of what the PSNI have called a ''high-intensity'' investigation. The owner of the hotel, Michael McElhatton, was arrested on suspicion of manslaughter last Tuesday, but was released on bail late on Wednesday night. The police had also arrested him on a drugs charge but withdrew that after discovering that a white powder found at his home had an innocent purpose - locals took to social media to express their dismay at the rush to judgment that followed this initial mistake on the police's part. Another 40-year-old man, who was taken into custody in connection with the deaths, was granted anonymity by the High Court in Belfast and the court was told that since being detained the man was taken to hospital twice for psychiatric assessments. Part of what has made the investigation so complex is the number of different schools and areas that were represented in the crowd outside the Greenvale Hotel on St Patrick's night. Over the last few decades, Cookstown has been the youth entertainment mecca of Co Tyrone. The town's location, with the border to Derry just a short distance away, makes it popular with revellers from towns spread over four different counties. It has been speculated locally that the number of disparate groups present contributed partly to failure of those at the back of the queue to understand the carnage up ahead of them. Eyewitness accounts from the teenagers who were present paint a shocking picture. One young man, who spoke to the Sunday Independent on condition of anonymity, described the terrible scene that unfolded. "We were all waiting for the gate into the place to open. There was a big crush and people were pushing from the back but they couldn't hear the people in the front. Then the pushing started moving from side to side and the whole (queue) collapsed. There were lots of people on the ground. People who fell could not get up. It was hard to breathe. It was so scary." Another girl, Ebony Johnston, described the chaos of the moment: "People just started to fall but as one person fell, another went down. As a person went to lift another person up they were pushing and shoving and another person would fall, which caused a build-up of everybody lying there. It was just a tragic situation. We are all so lucky that it was not any of us. We nearly feel guilty because it was not us, we nearly feel bad, what the families are going through is awful." While there are a fair amount of questions awaiting the organisers of the event, among some in Tyrone there has also been anger at the shared culpability of those who pushed forward so forcefully towards the entrance of the Greenvale disco. Another local parent tearfully told the Sunday Independent: "Someone needs to find out who was pushing, who was ignoring the screams. Those kids could have been any of ours." The generation of young people of which Lauren, Morgan and Connor were a part, are one of the first in Northern Ireland to grow up without the horror of sectarianism. 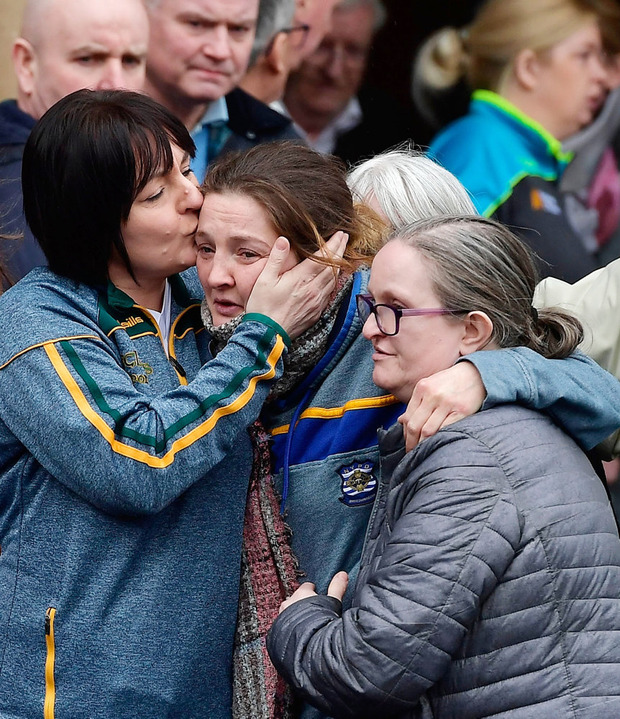 Despite this there were reminders of the community divides in the province, both in the absence of any senior DUP figures at the funerals - they were attended by Katherine Zappone and Mary Lou McDonald - and in the memory of Morgan Barnard's uncle Patrick, who in 1976 was also killed en route to a St Patrick's Day teenage disco. In the 1976 atrocity, Patrick was only 13 and one of four people killed in an UVF bomb attack outside the Hillcrest Bar in Cookstown. Among the four Catholics killed in that sectarian attack was Patrick's friend, James McCaughey, also aged 13. Four decades later Patrick's nephew died in the era of camera phones and social media. With the number of teenagers present on the night it seems incredible that more footage of the night has not emerged - but the PSNI has appealed to those who took pictures not to share them on social media. They added that they are ''aware of fake social media profiles linked to events of this week and are currently working with the relevant companies to have them removed. We are also looking to establish who is behind them with a view to arrest and prosecution''. Tyrone continues to absorb the sheer scale of the tragedy that unfolded last week. In the last few days, specialist counsellors were sent into local schools to offer support and youth centres opened their doors for young people to voice their feelings. In Cookstown, some locals have compared the situation to Hillsborough, in which 96 people lost their lives during a crush at an English football match. As Friday turned into Saturday, the bouquets of flowers continued to pile up outside the Greenvale Hotel. The roads outside the churches in Donaghmore and Edendork, which had been thronged with reporters and photographers, fell silent. The media circus moves on, and the legal process will take its course, but for three luckless families the nightmare of grief is only beginning.